Madam Vera Garbutt was born in Brighton, and after a successful career as a professional dancer, she established Vera Garbutt School of Dancing. I spent several happy years in the late 1950s early 1960s at her dancing school I think it was in Knowle Road. Can anyone else remember these times? If you would like to find out more about Vera Garbutt, she is featured as ‘Personality of the Month’ on the Royal Pavilion and Brighton Museums blog here. Hi Sue. Enter Vera Garbutt in the search box at the top of the page, there are a couple of entries about her. I attended a dancing school in the period 1940 to 1950, and think it was the same one in Knoyle Road, next to a church. The name Vera Garbutt rang a bell. I was delighted to see your picture of Vera Garbutt. Though a pupil of Miss Vera Sutton School of Dancing in Haywards Heath, I also attended classes with Vera Garbutt; classes and rehearsals which were held at Preston Park in a room at the rear of The Crown and Anchor. One dance rehearsal which I attended was for a pantomime in Tunbridge Wells starring Scott and Whaley. 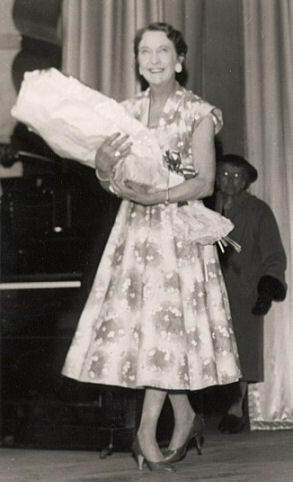 Vera Garbutt was a brilliant teacher and choreographer, I was lucky in my short dancing carrier while a pupil. See also Clarkson Rose Theatre Royal pantomime Aladdin 1945. Oh what a good teacher and my memory of happy dancing days so long ago. I attended Vera Garbutt School of Dancing from 1943 to about 1954. What a fabulous time we all had and what a good teacher she was. I would love to hear from any ex pupils. I recently learned my mum, then Josephine Baker, was also a pupil. This was probably during the early 40s. Does anyone remember dancing at the Grand Hotel in the late 1950’s? It was very grand and left quite an impression on me – I also was involved with one visit to the Royal Pavilions – does anyone remember these occasions? I remember attending the dance classes at Vera Garbutt’s in Preston in the late 1940s. 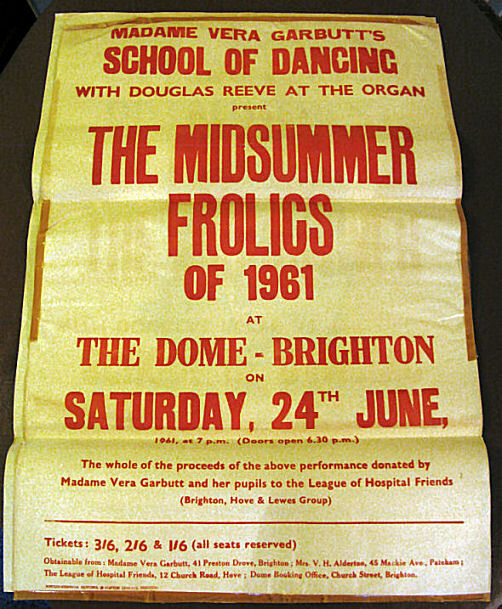 Particularly dancing at the interval period at the Regent Ballroom as a Snowflake! Can’t imagine what the theme was? Hello Sue. Please could you contact me about the picture of Vera Garrett. I wish to reproduce it in a book I am writing about my theatre group which celebrates it’s 90th birthday this year. Vera Garrett produced 11 of our shows right up until her death in 1963 and it would be lovely to feature her. Email lampschair@gmail.com With kind regards. I too was at Vera Garbutt’s for 12 years from 1951 and knew her very well. Answering the request for the title of the music for the Snowflake dance routine, it was Dance of the Hours by Puccini. We had general dance class on Wednesdays and ballet class on Saturday mornings and we took the BBO ballet exams. Some of her pupils had private lessons at her house in Preston Drove where Kiki, her black poodle, would always bark. Does anyone remember the Gilbert And Sullivans we did at the Dome? HMS Pinafore, Pirates of Penzance, The Mikado, Iolanthe? We also did many routines, group as well as solo, at Tuesday night at the Dome with Douglas Reeve. 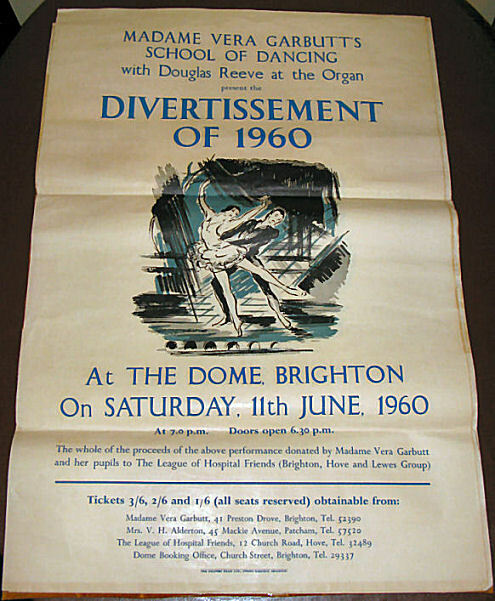 In addition we did routines at many hotels, Hove Town Hall, The Regent, the Corn Exchange, Royal Pavilion and other venues. I have many photos of these times together with all the programmes and still have many of the costumes. My big sister Violet went to dance classes in the early 1950s. I think it was Vera Garbutts, but I’m not sure. One New Year’s Eve, possibly 1951/2, there was a posh dinner at the Corn Exchange, and the dance school provided an entertainment. Violet’s part was to hide inside a big imitation cake and jump out on the stroke of midnight. Does anyone else remember this? 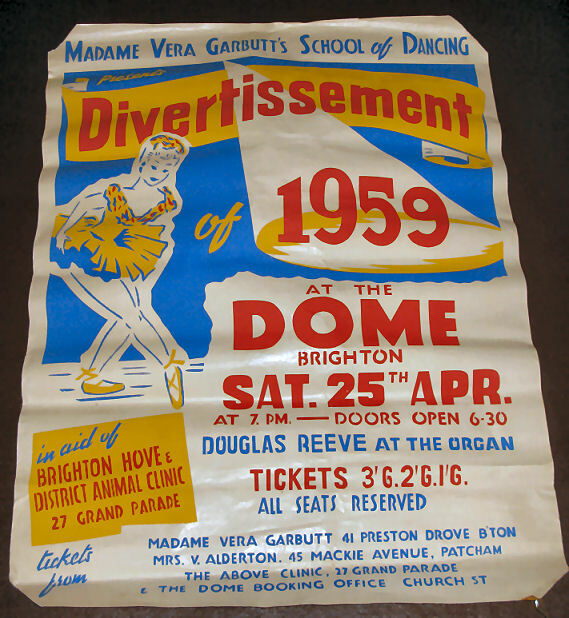 Vera Garbutt & Harry Drury produced very sucessful musical comedy shows for Worthing Musical Comedy Society in the late 1940s & 50s.